This is Benidorm's busiest beach considered one of the best in Europe. The sand quality is excellent as is the clean water. The beach is long and wide but nevertheless is completely packed in summer. South of Benidorm's Levante beach, Poniente beach has less restaurants and bars behind the beach but therefore a different, quieter atmosphere no more so than the promenade lined with palms giving welcome protection from the sun. The theme park of Terra Mitica is one of many theme park attractions surrounding Benidorm. Terra Mitica has rides and shows focusing on the legendary civilisations of the Mediterranean. 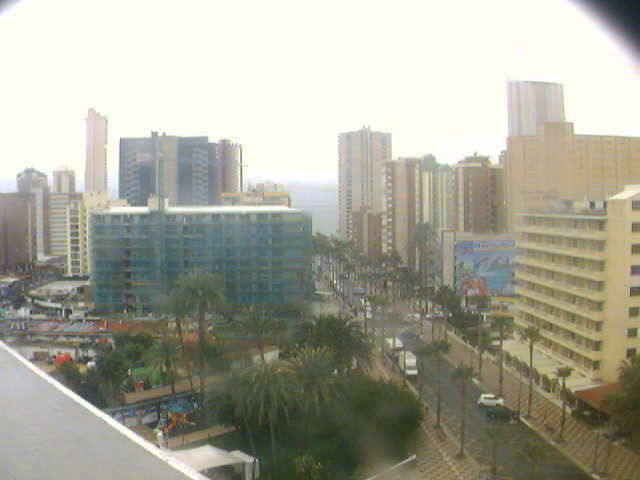 At the bottom of this webcam page you will find many links to other Benidorm tourism pages, in particular if you are interested in webcams of Benidorm and cams of Benidorm then you may also want to see what the current weather is for Benidorm, along with a weather forecast for the next few days in Benidorm.